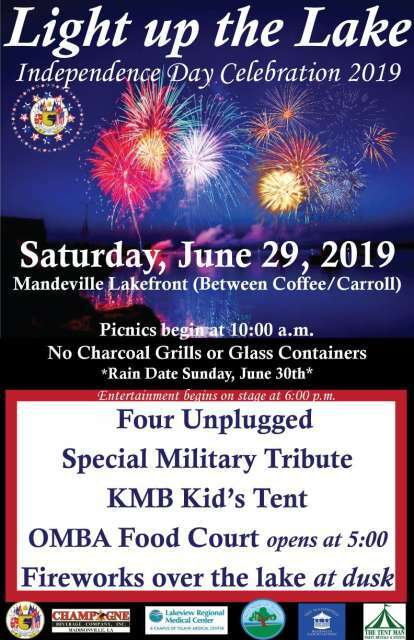 Join the City of Mandeville on Saturday, June 29 for Light Up the Lake: Independence Day Celebration 2019! 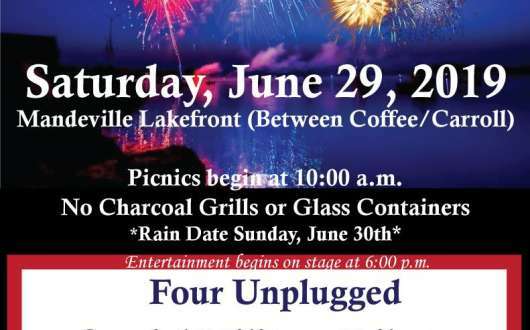 The fun family event takes place on the Mandeville lakefront, where the public is welcomed to bring picnics (no glass containers or charcoal grills, please) beginning at 10:00 am. A food court sponsored by the Old Mandeville Business Association (OMBA) restaurant members will also open at 5:00 pm. Entertainment begins at 6:00 p.m. on a stage located between and Coffee and Carroll Streets, with live music and a military tribute, plus a kids' tent for the little ones. The evening will close with a festive display of fireworks at dusk. For more information, visit www.cityofmandeville.com.